Clients can avail from us Ladies Body Warmer as we are a leading manufacturer, supplier and exporter of Ladies Body Warmer. Ladies body warmer is ideal to keep the body warm during the harsh winter months and manufactured from fine quality of fabrics. While being available in down, fleece, soft shell types, ladies body warmer is known for exquisite design and skin friendliness. 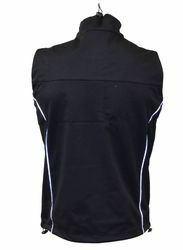 We are a leading manufacturer, supplier and exporter of Inner Body Warmer. 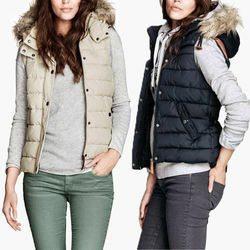 Inner body warmer offers high warmth, comfort, soft feel and is designed from finest grade of fabric. Perfect finish, skin friendliness, optimum quality and long functional life are special characteristics of inner body warmer. Available in sleeveless and sleeve forms, inner body warmer retains warmth irrespective of changing environmental conditions. Known in the industry as a prominent manufacturer and exporter, we are engaged in offering Soft Body Warmer. Soft body warmer is made of water repellant polyester micro poplin and comes with an elasticized waist while simultaneously providing the highest thermo guard insulation. Designed as a three layer soft fabric, soft body warmer has a woven surface, performance membrane and an inner micro fleece layer. Looking for Body Warmer ?